Surround sound technology made a significant advancement in 2012 when Dolby Laboratories debuted the ultimate surround sound experience dubbed Dolby Atmos. Many movie theater chains began replacing their 5.1 and 7.1 surround sound systems for Dolby Atmos equipped theaters, some even requiring an upcharge for the Dolby Atmos experience. Now, we are witnessing a new trend of Dolby Atmos slowly making a mark on nightlife by introducing Atmos into nightclub sound systems. The possibility of having Dolby Atmos available at your local nightclub is something that is exciting and promises more creativity for DJs to experiment with 3D sound placement, as well as a more dynamic music listening experience for club goers. The switch to Dolby Atmos is a step away from traditional stereo systems found in most venues and nightclubs, which only allow the placement of sound in the left, right or center channels. With Dolby Atmos, the increased speaker count allows the DJ to place a sound in 128 different placement points around the room. First introduced to London’s Ministry of Sound nightclub in 2016, Dolby Atmos proved to be a successful investment that revealed a new market available for Atmos technology. In 2017, Chicago’s Sound-Bar nightclub became the second venue to brand itself with Dolby Atmos. San Francisco’s, HALYCON, is now the third music venue in the world to introduce Dolby Atmos, and the first on the West Coast. Debuting the new sound system with 14 additional Pioneer speakers, HALYCON with sure to attract more attention with upcoming events featuring artists like I_O, Chus & Cabellos, Christian Martin, Doorly, Hydra, Solarstone, and Yousef. The process of mixing song stems in Dolby Atmos requires extensive preparation using Dolby’s panning plugin to place the instruments around the room to create an immersive experience. Luckily, Dolby has a useful Stem Creation Guide included on their website that may help clarify this process for DJs who have never mixed in Dolby Atmos before. According to the guide, DJs should approach their stem creation with the final format of a maximum 12 total groups/stems. The drums and bass would remain stereo, and only the melodic and FX elements would be the sound “objects” placed around the room. These types of elements might include stems such as Keys, Pads, Synths, Leads, Percussion, FX, and Vocals. With this information it is clear how valuable obtaining the individual stems to a song is when DJing in Dolby Atmos. 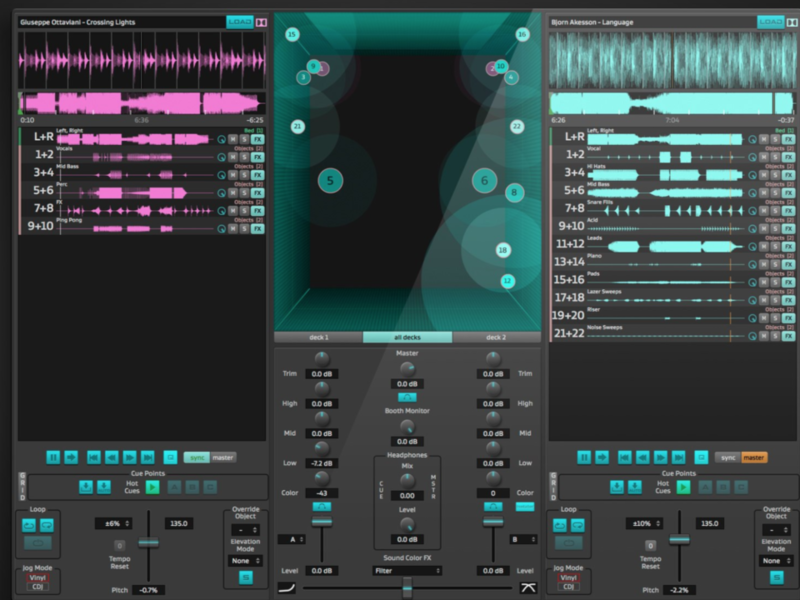 XTRAX STEMS can be a useful tool if you do not own or have access to the original stems of a song. Given that DJs would need to have the stems to the song to play in Atmos, XTRAX STEMS can become incredibly useful for someone who may want to DJ at a venue with Atmos technology. Only time will tell if Atmos continues to spread to other venues and if audiences will express increased interest in events presented in Dolby Atmos.